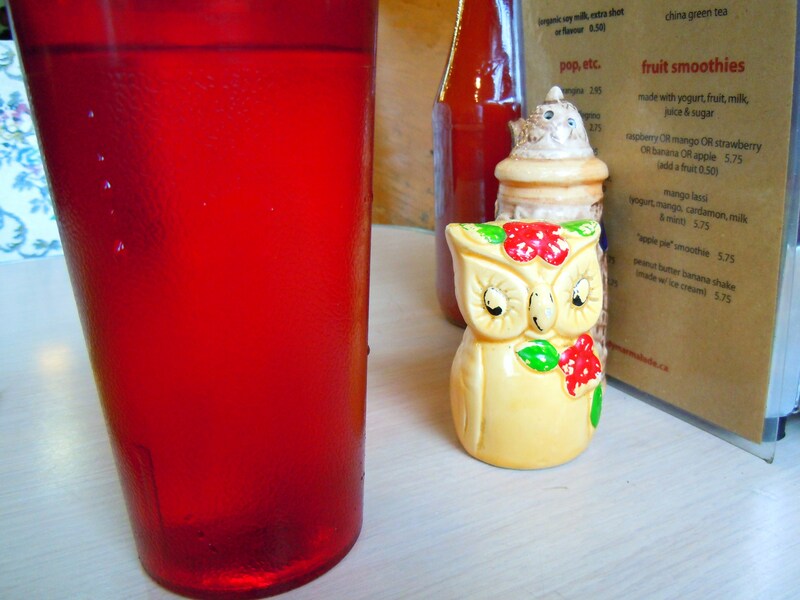 Leslieville has made it onto the blog and with it, Lady Marmalade! I promise to do a Foodie District round-up post for Leslieville the same way I did for Kensington Market and no, I haven’t forgotten about our beloved Roncesvalles Village either! I’m so excited to be posting about all these different neighbourhoods in the city and showcasing the yummiest of the yummiest, at least to me! I pass by and even frequent certain areas of town on the streetcar fairly often but it’s a totally different story when you hop off and walk east and west, north and south, up and down and all around. Queen Street is probably the road I’ve travelled most frequently on via streetcar (almost from one end to the other and back on a number of occasions!) and I’ve passed by breakfast, brunch, and lunch diner Lady Marmalade in Leslieville more times than I can remember. I had heard fabulous things about Lady Marmalade and I had seen the fabulousity taking place out on the curb. People weren’t lying when they said the diner faced lineups out the door during weekend brunch! For the record, I ate here during a weekday morning and I thankfully secured a spot before the real crowds started coming in, which they did at 10:30am no less! 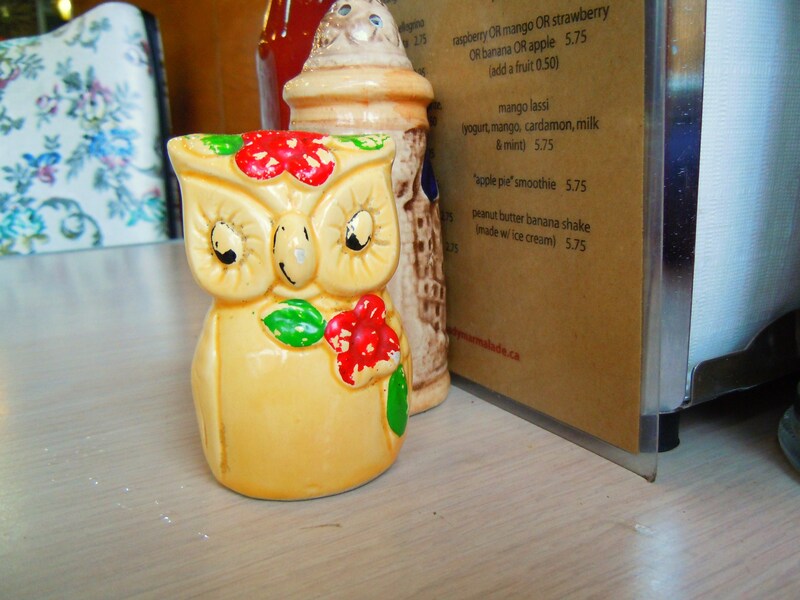 The decor at Lady Marmalade almost makes me giggle because there are aspects of it that are so 70s it hurts! Think 70s mismatched upholstery, moss green and burnt orange, and salt and pepper shakers. It’s all in good cuteness and I find it endearing! I think it’s what makes Lady Marmalade the brunch powerhouse and character that it is. 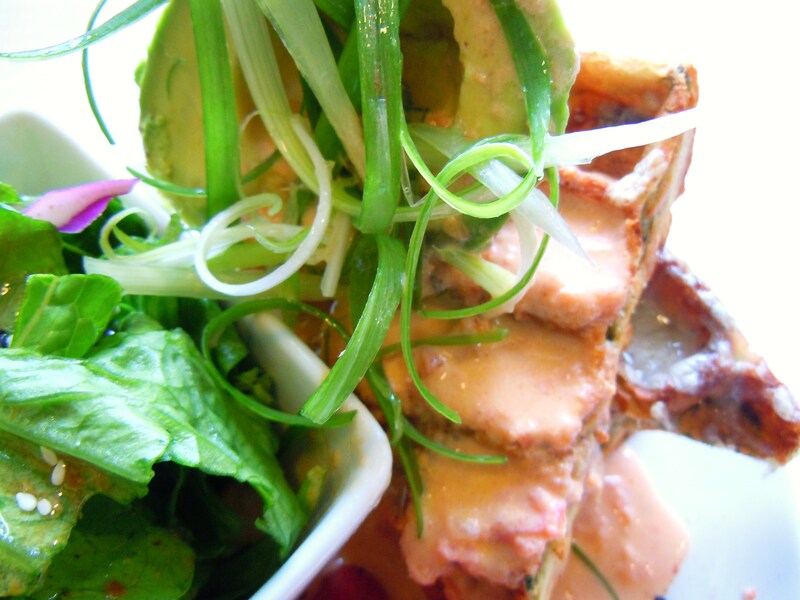 Aside from the punchy decor, the menu packs a punch like you wouldn’t believe. They serve all-day breakfast and all-day lunch, and classic breakfast dishes such as eggs benny, crepes, and huevos rancherous are given special touches that make them uniquely Lady Marmalade. 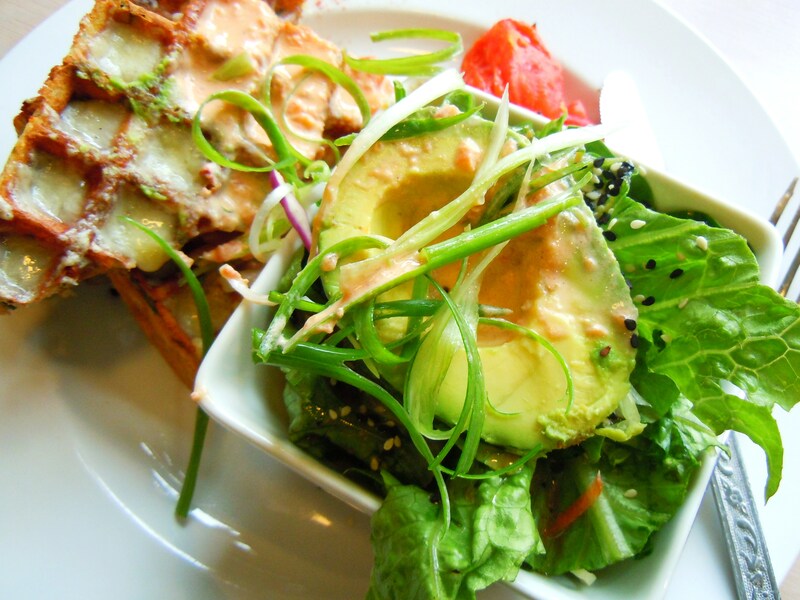 Think miso-scallion cream with crepes, huevos rancheros with basmati brown rice, pesto bennies, tofu scrambles with bok choy, a good morning poutine, and a menu boasting lots of scrumptious avocado! 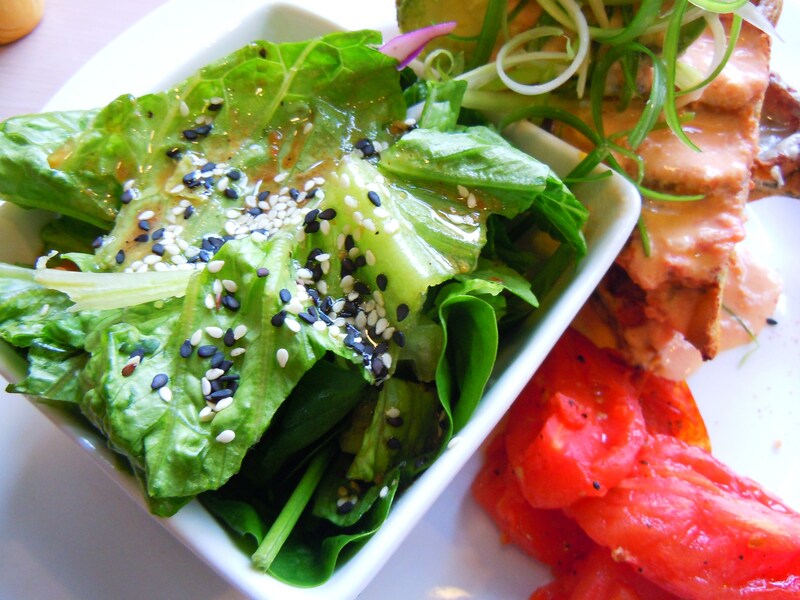 Lunch items include sandwiches, rice bowls, and meal size salads, and the large drink menu offers fruit smoothies, loose leaf teas, coffee, juices, and different types of soda drinks. Brunch prices come in at around $7.50-$12.50 with most dishes at $11.50. The only down side? 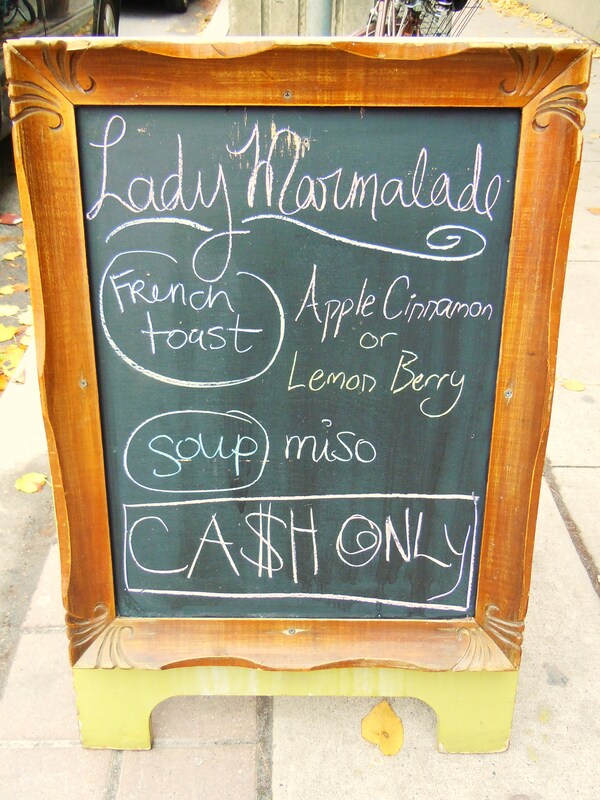 Lady Marmalade only accepts cash. No credit cards or debit cards, much to the chagrin of many hungry brunch goers. You know everyone brushes off that little bit of nose wrinkling though because no matter what, this place is popular and packed. One of the best things about their menu? 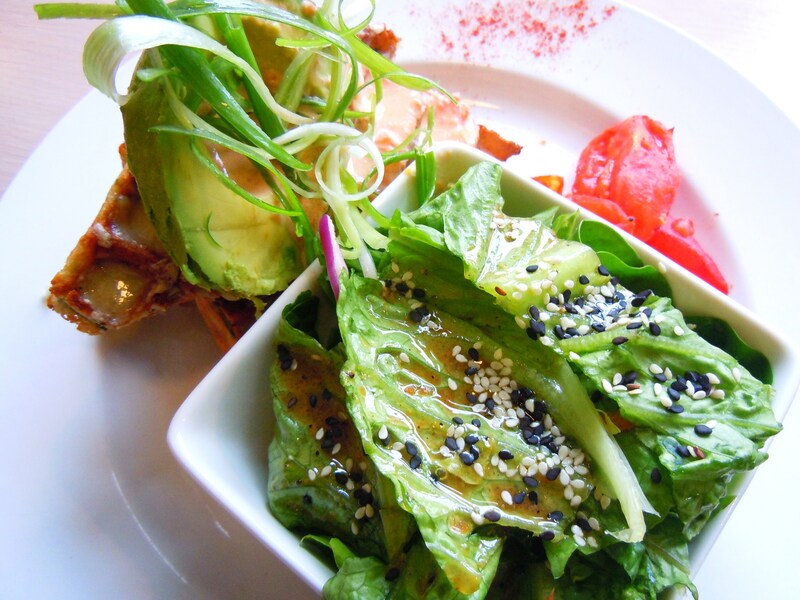 You can easily make many of the breakfast dishes vegetarian and vegan which makes Lady Marmalade the perfect brunch spot for meat-lovers, vegetarians, and vegans alike. 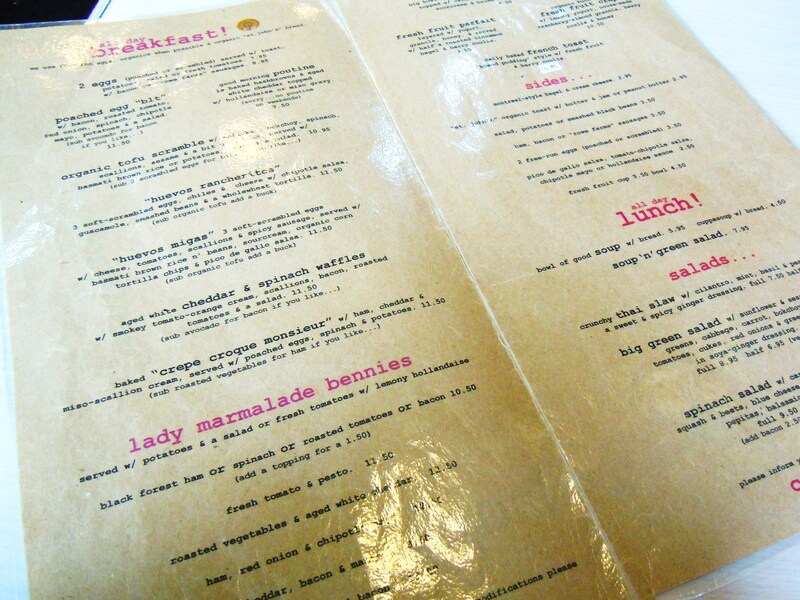 A number of their dishes are already vegetarian to begin with, but we all know breakfast options can be laden with eggs and butter and cream, so Lady Marmalade’s menu offers plenty of opportunities to turn meat or vegetarian meals into vegan ones with little lists of “a, b, or c” choices that accompany said menu items. Even though some meals offer bacon, sausage, and ham, as meat choices, I find Lady Marmalade’s menu to be pretty darn healthy in general! I mean, breakfast diners are breakfast diners; you’re going to have some level of indulgence and decadence no matter what. 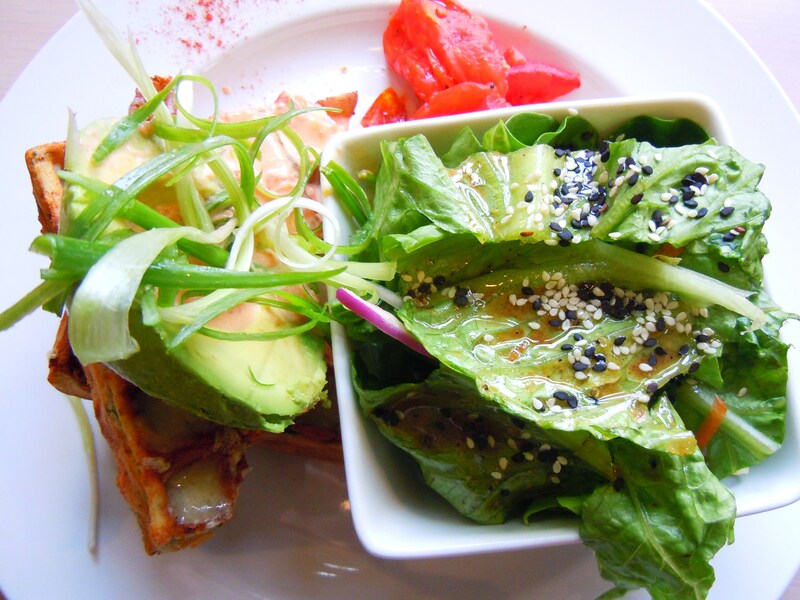 You can tell though that Lady Marmalade’s menu was, and is, well-thought out for the healthy and hearty in mind because there are lots of vegetables in all different forms all over the menu in the breakfast portion and in the lunch portion. Everything on the menu sounded delicious, but I wanted to go for something a little different. There were many options I would have normally pounced on (tofu scramble and huevos rancherous, I’m looking at both of you! ), but I wanted to show you all a dish unlike anything else I had previously blogged about so I chose the mouthwatering aged white cheddar and spinach savoury waffles! 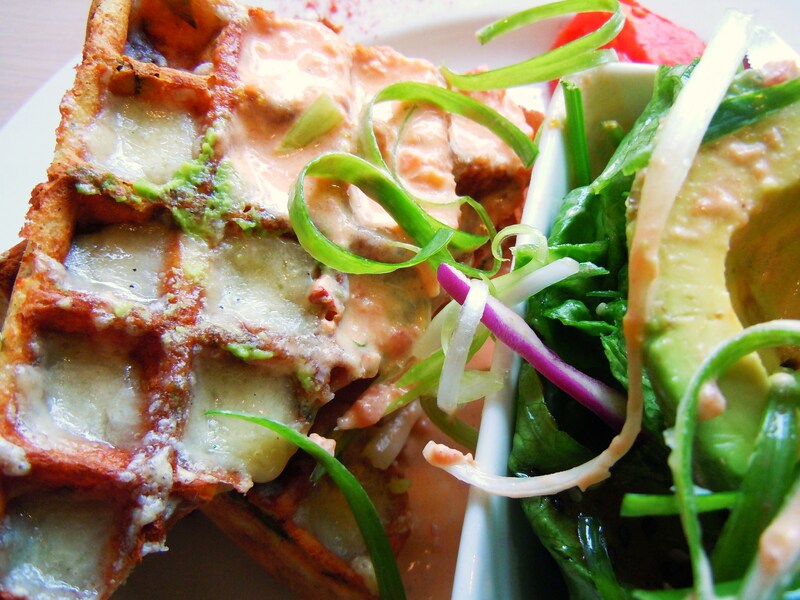 The waffles, which come Belgian style and sliced in half diagonally into perfect triangles, are served with melted aged white cheddar cheese and creamy orange sauce on the tops, spinach cooked right into the waffles, and roasted tomatoes, salad, and a choice of bacon or avocado. I could live off of avocado, so that choice was a no brainer for me! There were so many amazing dimensions to this meal and they were all delicious for completely different reasons. I loved each and every part of the dish, but what I loved and appreciated the most was the complexity of flavours and the cohesiveness of the dish in its entirety. Every single thing had a flavour role to play and they played off each other so well. Before I get into the deliciousness, I want to explain what I mean by cohesiveness. We’re talking about savoury waffles with cheese on them, a rather strong cheese that’s been melted on spinach waffles. When we think waffles, more often than not, we associate them with sweet flavours. Thus, if the waffles had been served on their own, they would have been too rich and too savoury because dishes like these need other textures and flavours to break up the richness. Alongside the roasted tomatoes, salad, and avocado, everything worked because all of these functioned as palate cleansers. The tomatoes were warm, juicy, and slightly acidic, the giant avocado (they gave me half an avocado, oh my goodness!) was cool, thick, and creamy with no distinctive sweet or salty taste, the orange cream added a zing of fruitiness, and the green salad was crunchy (which contrasted with the chewier texture of the cheese waffles) and extremely refreshing with an amazing sesame dressing with white and black sesame seeds to boot! Here’s another very important thing to point out: the waffles taste 100x more fabulous when they’re cold! I don’t mean refrigerator cold, but just no longer warm. I KNOW. No, I am not nuts. I don’t know what it is about certain foods tasting a thousand times more foodgasmic when they’re cold, but I’m dead serious about this. It could be that the flavours have time to settle in and intensify over time, or maybe heat just alters the way certain things taste. We all know how disgusting French fries taste when they get cold, but we also know how some people are gaga over cold pizza. This is one of those delicious cold pizza or spaghetti examples. 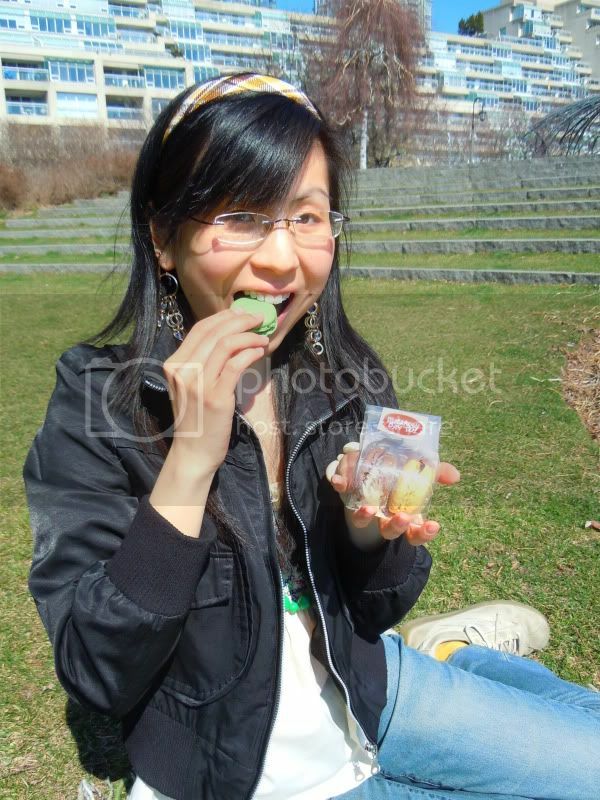 I know, when you eat out you’re most likely ravenous, but trust me on this one. If you have the willpower, take a bite when it’s hot, chat with a friend for about 10-15 minutes before digging in again, and you’ll notice the difference and thank me for it. 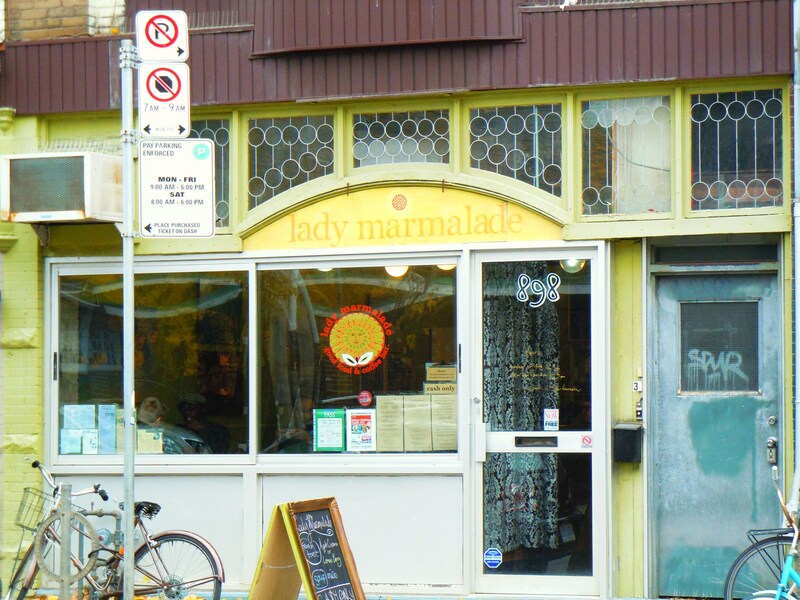 Lady Marmalade is located at 898 Queen Street East in the Leslieville neighbourhood just west of Logan Ave. They are open 7 days a week for all-day breakfast and all-day lunch. From Monday-Friday, the diner is open from 8am-4pm, and from 8am-3pm on the weekends.